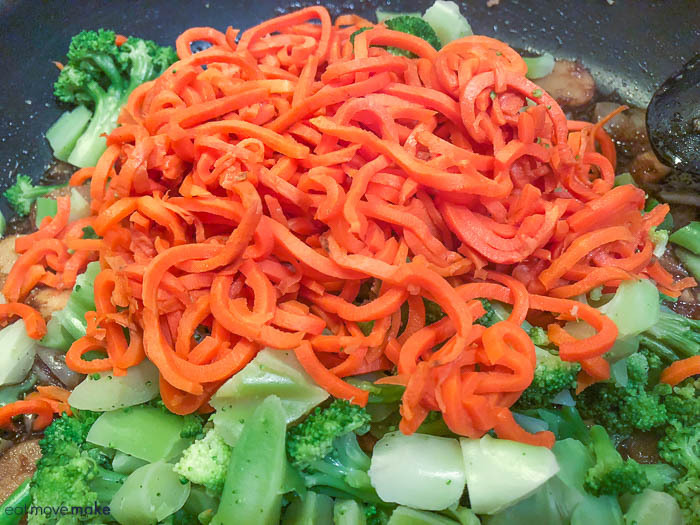 Easy Asian Stir Fry Recipe with Carrot Spirals - Who Needs Noodles? 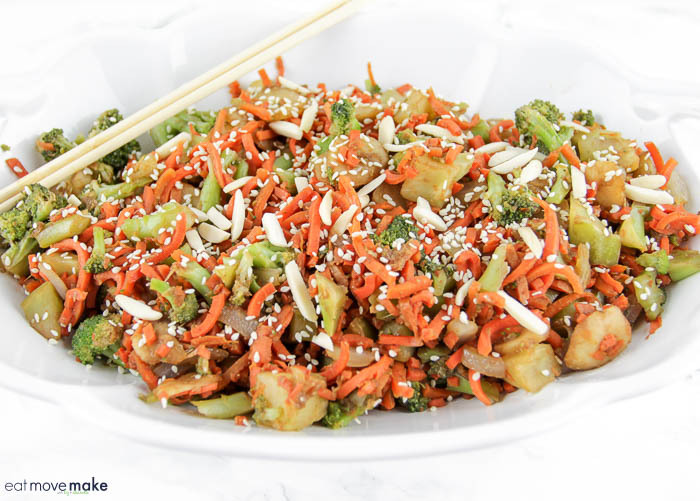 This easy Asian stir fry recipe with carrot spirals was sponsored by Green Giant as part of an Influencer Activation for Influence Central and all opinions expressed in my post are my own. 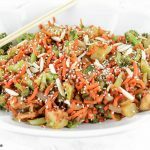 I am so excited about this stir fry recipe because it fits in perfectly with all the lifestyle and meal routine changes I’ve been making in 2018, and it has lots of veggies — my favorite food group. My next favorite food group is carbs, and while I will never completely stop eating them, I love finding tasty replacements for them — like the spiralized carrots in this recipe! If you think I spiralized them myself, you’d be wrong! I do have a spiralizer, but I’ve never used it, and now that I’ve discovered the new Green Giant® Veggie Spiralsat Walmart, I may never need to take it out of the box. The veggie spirals are made with 100% vegetables and since Green Giant smartly decided to skip the sauce and seasoning, they can be served any way you like. Use them as an entrée, a side dish, or soup! I’m using them in my entrée as a gluten-free swap for noodles, and I love that they have fewer calories than pasta (65 percent to 90 percent fewer per serving than the leading brand of spaghetti). The veggie spirals can be cooked on the stove top or in the microwave (still in packaging) in minutes, then you drain them exactly like you would for pasta. They look amazing, don’t they? I cooked my veggie spirals in the microwave, drained them and added them to my stir fry sauce pan. I tossed the veggies around to get them covered with the delicious sauces and seasonings I used, and in just a couple of minutes I had dinner on the table. And my family and I loved it soooo much! 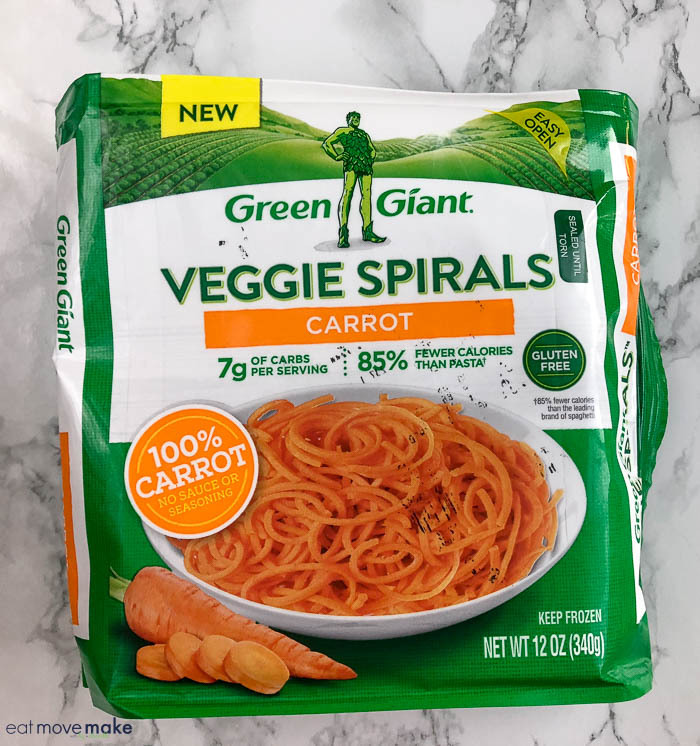 I can see myself replacing noodles regularly with Green Giant® Veggie Spirals, and since they’re available in four varieties: Carrots, Butternut Squash, Zucchini and Beets, the possibilities for delicious meals are endless. Cook the Green Giant Veggie Spirals™ Carrot, and Green Giant® Steamers Broccoli Florets according to the package directions. Drain well and transfer to a medium bowl. Preheat a large nonstick skillet over medium heat. Add sesame oil, garlic, and ginger and cook until translucent, about 2-3 minutes. Add soy sauce and heat until bubbling, about 1 minute. 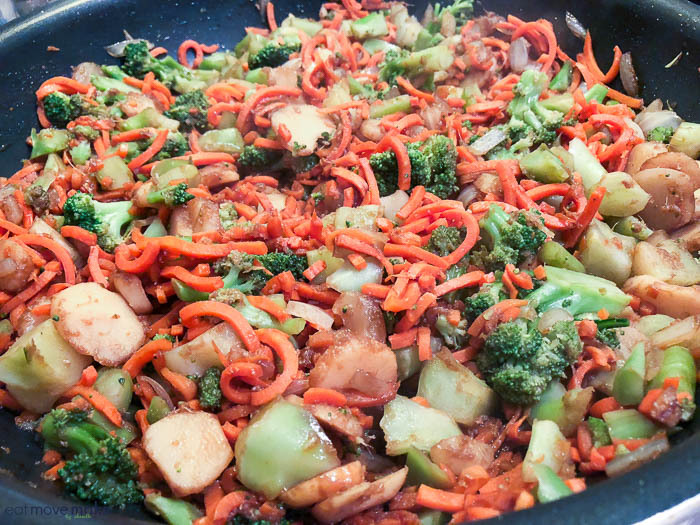 Add the carrot spirals, broccoli florets and water chestnuts to the pan. Gently toss all ingredients together, and heat 2 minutes. Place in a serving dish. Top with the sesame seeds and sliced almonds. Serve hot. Add diced grilled tofu or cooked chicken, pork, beef or shrimp for added protein. 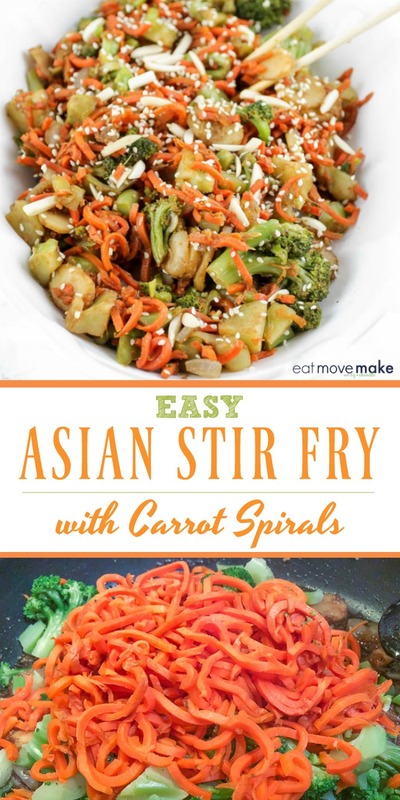 I hope you love this easy Asian stir fry recipe with carrot spirals as much as my family and I did. It’s a winner for sure! Check out all the Green Giant® Veggie Spirals and recipe ideas, and enjoy a new take on noodles — voodles! I love stir fry. This recipe looks so delicious. I will have to look for these carrot spirals. This looks so good. The spirals make the recipe look so authentic! Quick and tasty! We have stir fry a lot at our house. 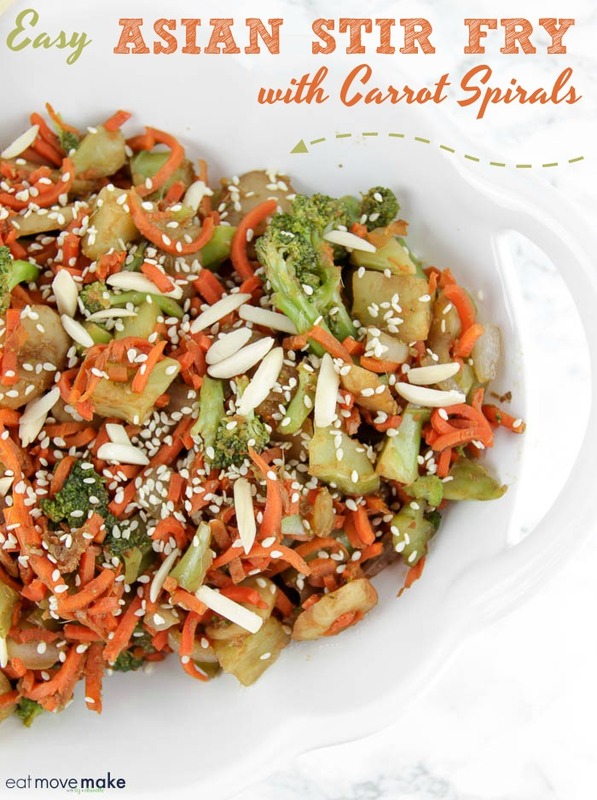 I LOVE using veggie spirals for fun recipes (like this one – sounds fantastic! ), but I always order them fresh and often they go bad before I get to them. I’m really digging the idea of being able to get these in your freezer aisle! That sounds so good. Really quick and easy so perfect for a weeknight meal. I love that even if I don’t have a spiralizer, I can just pick up spiral veggies at the store now. So convenient! OH I need to try these carrot spirals! What a delicious recipe! Those veggie spirals are incredible. I will have to get these next time I am at the store! My family loves Asian food so I will definitely be trying out this recipe! Ordering Asian food can be so expensive, this is a budget-friendly way to have our favorite type of meal. Wow, this looks really yummy! I saw these at the market and should have bought a few boxes. This would go over BIG in my house. 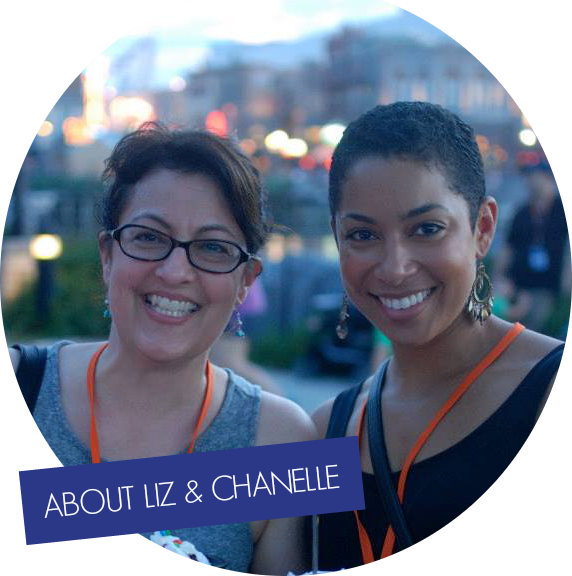 Those veggie spirals sound awesome, too! Yummy! This will make for something different for dinner! I haven’t seen carrot spirals at our grocery store. Yum! This looks delicious. I think carrot spirals would be perfect for this recipe. Carrot chunks always take way more time to get done so they are overly crunchy. Smaller pieces for the win! That dish looks amazing and the spirals are so smart. My son has been asking for butternut squash for so long so now I know where to get it and how to cook it. Awesome! Now I have a new way to make veggie spirals! I love these new spirals, because I don’t have to take out my spiralizer.